It is a well documented fact that dragons terrorized the countryside of many medieval nations. France, England, and Poland were hit especially hard, and that is reflected in the art and legends from that time. Luckily, dragon slayers rose up to overcome our tyrannical lizard overlords! Many scholars postulate that the dragons simply learned to hide themselves better, and that society is now run by a cabal of ancient dragons! These gigantic, scaly monsters have been secretly controlling the world’s governments for centuries, and now they’re coming out of hiding, looking for human prey. But you’re in luck! We here at Fun.com have developed this stat- of-the-art camouflage. 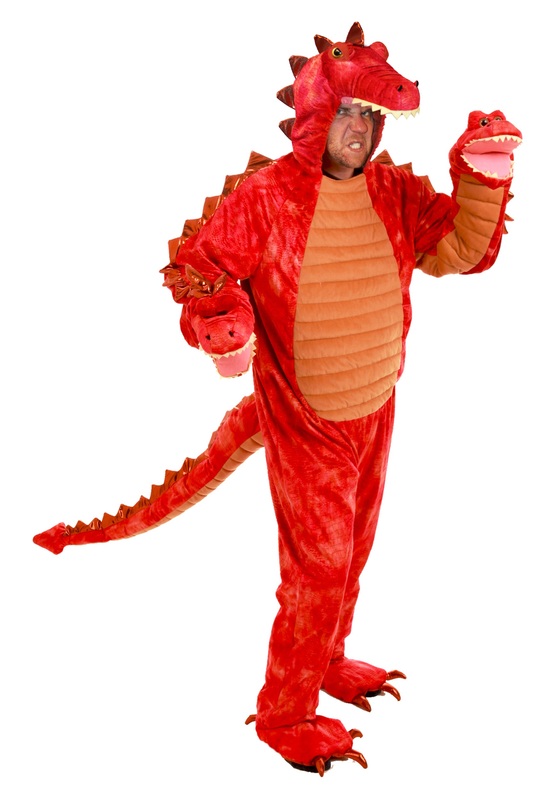 The Adult Hydra Red Dragon Costume cleverly confuses those lizard brains into thinking that you are not one, not two, but three of those fire-breathing terrors. Wearing this costume, you will be able to freely go about your business without worrying about scaly horrors deciding that a human snack would satisfy their craving. If being dragon kibble doesn’t appeal to you, definitely check out this Adult Hydra Red Dragon Costume. The one piece bodysuit and shiny scales perfectly resemble the natural red and black of a real artist’s interpretation of what a dragon might look like. The large plush tail is perfect for really convincing the dragons that you are one of them. And luckily the oversized feet don’t fasten to your shoes, which makes it easy to don or remove the costume at will!